There are only a few worthy reasons to take a vehicle from concept form to production. 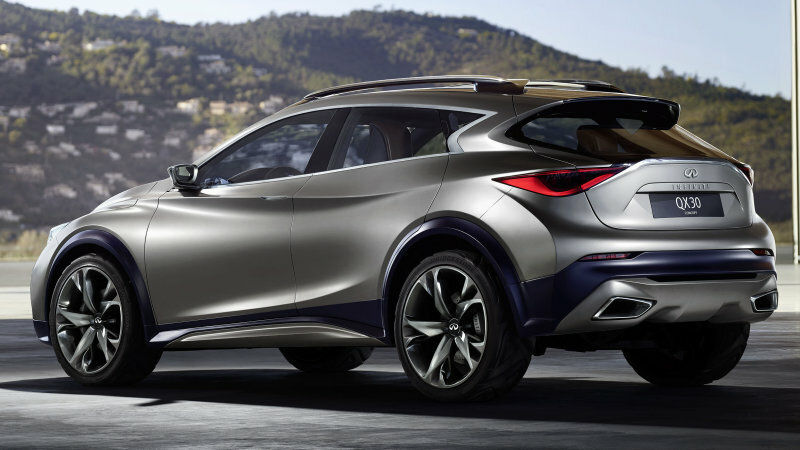 In Infiniti’s case, it has “less to do with size or power, [and] more to do with distinctive design and outstanding execution.” And Infiniti has made a great point with that comment. The Q30 compact crossover understands today’s generation of luxury driver. They like to save gas, hence its turbocharged 2.0-liter engine and 7-speed automatic transmission. But they also like to get where they are going in luxury and style, hence its bold lines, aggressive stance and 21-inch alloy rims. Today’s generation also prefers to actually ‘get’ where they’re going, and it shouldn’t matter if they are traveling through rain, snow, mud, rock or meteors. And this outcome seems awfully likely with the help of its Haldex-based all-wheel drive system, all-metal skid plate and carbon fiber reinforced bits. They also needs to feel connected to the world with a great big infotainment center and enough accent lighting to make even a trip through the desert of Nevada… eventful. The Q30 is on its way to production and from what we’ve heard, it isn’t going to be a whole lot different from the concept. And this makes it very worthy of a second look once it does finally crash onto U.S. soil in 2016/2017.